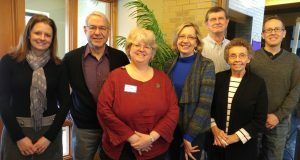 The St. Stephen Ministry Board is comprised of seven duly elected representatives of the St. Stephen’s congregation who fulfill roles and responsibilities specified by the St. Stephen’s constitution. Members can be elected to a maximum of two three-year consecutive terms. The Ministry Board meets monthly and members also serve in liaison capacities with St. Stephen’s Ministry Teams. Helping lead the congregation in stating its mission, to do long-range planning, to set goals and priorities, and to evaluate its activities in light of its mission and goals. Oversight and administrative responsibilities for the financial and property matters of the congregation. To maintain supportive relationships with the rostered member(s) and staff and help them annually to evaluate the fulfillment of their calling, appointment, or employment. To arrange for pastoral service during the sickness or absence of the pastor. To emphasize partnership with the synod and church-wide units of the Evangelical Lutheran Church in America as well as cooperation with other congregations, both Lutheran and non-Lutheran, subject to established policies of the synod and the Evangelical Lutheran Church in America. To recommend and encourage the use of program resources produced or approved by the Evangelical Lutheran Church in America.